Our sweet pies are served by the slice and are seasonal, with flavors changing every 3 months. Whole pies are available for pre-order. Please call 24 22 88 22 to order 24-48 hours in advance. Spring has sprung with the ultimate sweet/tart combination. With its golden woven crust, this juicy pie will remind you of warm afternoons stealing ripe strawberries and picking rhubarb in Grandma's garden. Recommended with a scoop of vanilla! If you’re a kid-at-heart, rejoice! With Oreo cookie crust, rich dark chocolate cream filling, fresh whipped cream and crushed Oreos, this sweetie pie will have you remembering your childhood days snacking on milk & cookies. As the saying goes: "Nothing is more American than Mom, Baseball, and Apple Pie”. Packed with layers of apples and a dusting of cinnamon in a flaky double crust, this superstar is the #1 classic pie. Top it with vanilla ice cream for the complete experience. We’ve gone berry picking down a wooded trail with this new seasonal pie. With a raspberry sour cream filling, this flavorful gem is topped with a crunchy oat and cardamom crumble and sprinkled with toasted almonds. Watch out for pie-stealing bears over your shoulder! With layers of cinnamon bread, vanilla, and a dash of nuts & raisins, this is the ultimate comfort food treat. Served warm with a melted sweet bourbon glaze, it’s pure perfection with a cup of hot coffee! Cookies + Brownies… a true girl scout experience. Rich fudge brownie with dark chocolate chips baked in a salted cookie and walnut crust. This is THE ultimate brownie adventure – scout’s honor! Indivdually served meat & veggie pies, made from scratch in a flaky, butter crust. The ultimate comfort food. Pulled chicken, carrots, celery & fresh thyme baked in a white wine cream sauce. This pie is big on flavor, with our own special blend of smokey spices, bourbon and molasses. Minced beef, carrots & peas cooked in marsala wine, and topped with cheddar mashed potato. Sweet potato, black bean, kidney bean, sweet corn, carrot, tomato, onion and spices (mild). Egg-based pies served in large slices, perfect for a light lunch or breakfast treat. so you can look forward to these favorites returning as the seasons change. Let's par-tay! 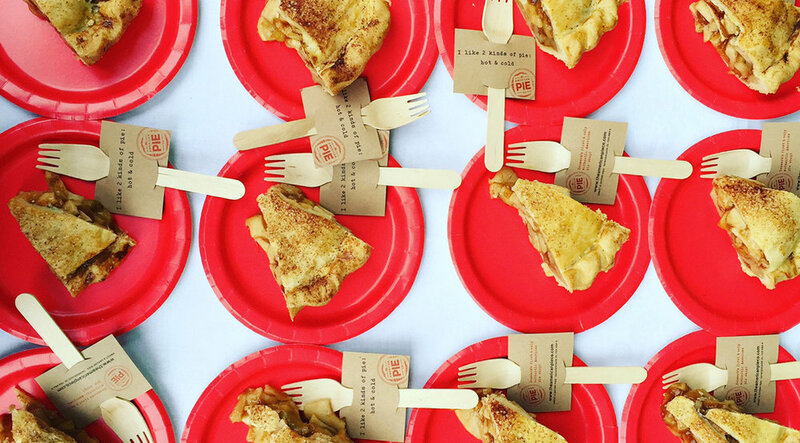 Whether it’s a birthday bash, corporate reception or team-building night, we can help make your event memorable and run smoothly with delicious pie and good vibes. 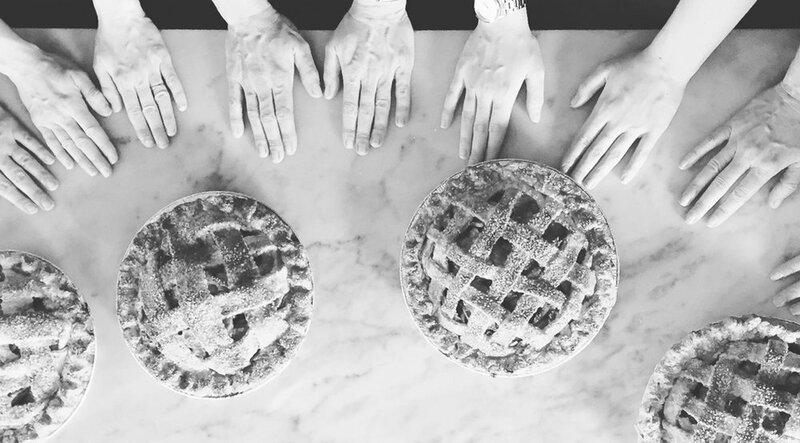 With our wide variety of delicious textures and flavors, our sweet pies follow the seasons, and have a handmade rustic elegance that will surely delight your guests of all ages. As an engaging experience, we can create seasonal table displays for your event, plus delivery and full service, to complement the pies being served. Our pie shop on Skindergade is just a 10 minute walk from Rådhuset in the heart of Copenhagen, and available for private events and receptions for up to 45-50 people, with its unique vintage decor and cozy surroundings. We’re also able to cater out-of-house if you’re hosting your event at another location. Please call us at (+45) 24 22 88 22 or email us via our contact page for inquiries. If you wish to special order whole pies, kindly pre-order 24-hours in advance by calling us at (+45) 24 22 88 22. Please see “This Season’s Pies” for current available flavors. We also offer The 8-Piece Variety Box, available for walk-ins at either location. Choose any variety of slices from the pie case – a perfect treat for dinner parties or the office! To-Go pies serve 8 people and can be scheduled for pick-up at either of our locations. Delivery is available for the inner-Copenhagen area for a fee. Because the pie shop is small, we only take reservations for tables over 6 people, and sorry, no reservations on Saturdays. There is a famous saying in the USA: “Nothing is more American than Mom, Baseball, and Apple Pie”, and Copenhagen finally has its first taste of the real deal. Found in nearly every mom-and-pop diner across the USA, pie is deeply rooted in America’s cultural DNA. 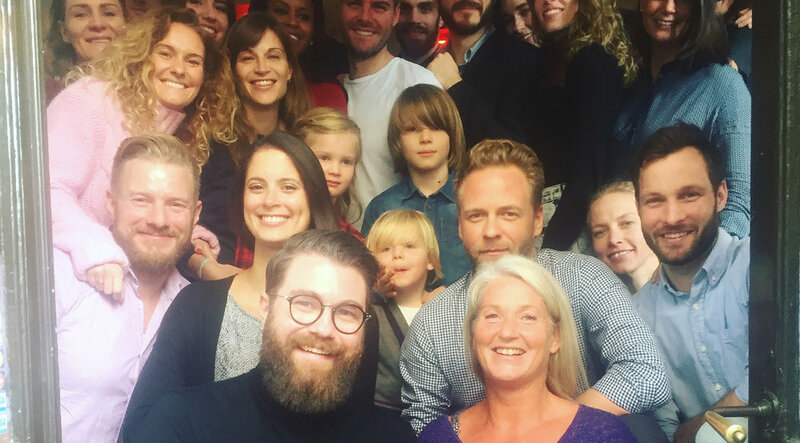 In October 2015, The American Pie Company opened its doors as Denmark’s first American pie shop to an eagerly awaiting public of Danish foodies and homesick ex-pats. Co-founders Erin Eberhardt Chapman and Dorte Prip shared a simple vision, and merged their complementary skill sets to set the wheels in motion. Erin hails from the farmlands of Illinois and the northwoods of Wisconsin, USA. Homegrown and home-cooking equaled love, and her obsession with food started with growing up on her grandparents’ farms, practicing family recipes, enjoying the abundance of her dad’s vegetable gardens each year, and inheriting her mom’s “baking-to-relax” tendencies. With over 20 years experience in the advertising industry, Erin has specialized in brand building and image development for lifestyle, food and fashion clientele on both national and international levels. 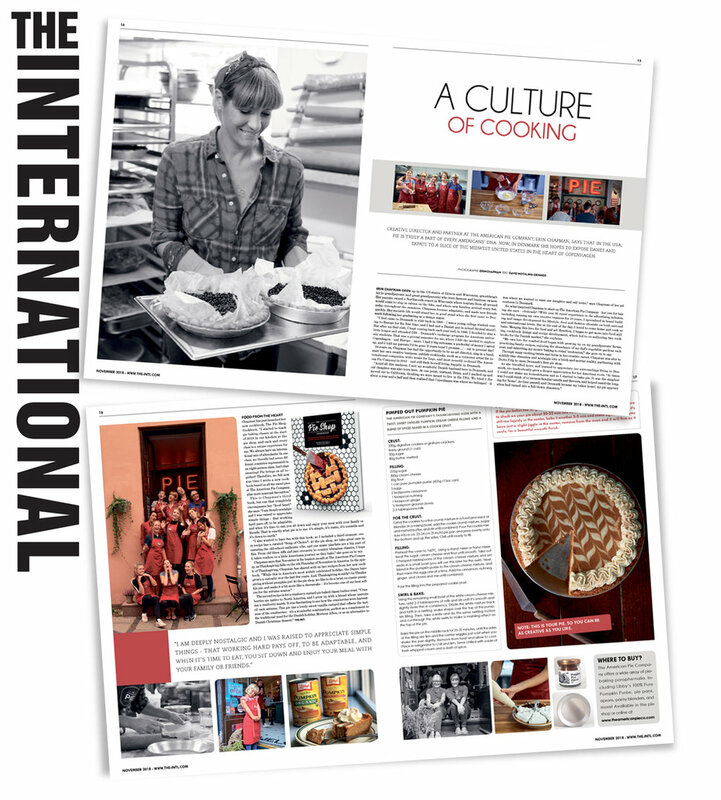 Merging her love for food and art direction, Erin began food styling, cookbook design and recipe development, and has co-authored two cookbooks, American Pie and American Diner. Having lived in Denmark since 1998, the merging of food and nostalgia has been a constant help to ward off homesickness. Dorte was born and raised in Denmark, and had the opportunity to attend the Stanford Graduate School of Business in the heart of Silicon Valley, where she whole-heartedly fell in love with the USA, and continued to travel back for the inspiration, the spirit, and the connection. In Denmark, Dorte built a career in retail as a senior vice president of Danish grocery powerhouse, Coop, where she acquired a keen sense of food quality, food ethics, and human relations. 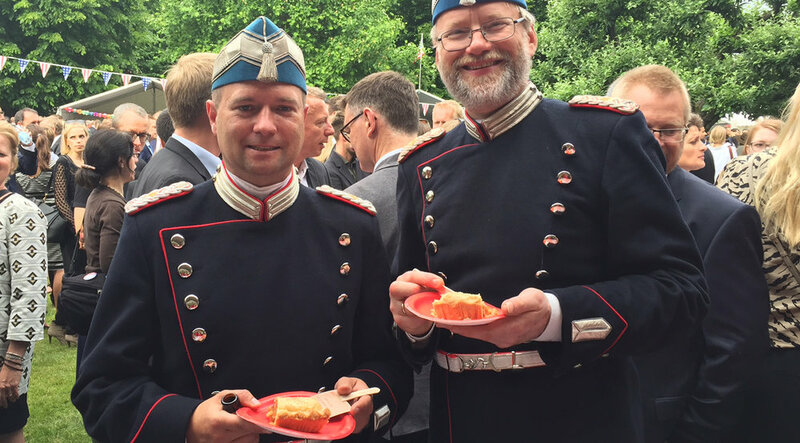 Dorte then moved on to becoming the CEO at Copenhagen Business School Executive. But despite a fulfilling career in Denmark, her “happy place” was still California, as it was there she was married, where her children have attended high school and college, and where her American family also lives. Wanting to pool her life experiences of retail, business, education, love of food, and American spirit, she was inspired to build something close to her heart. 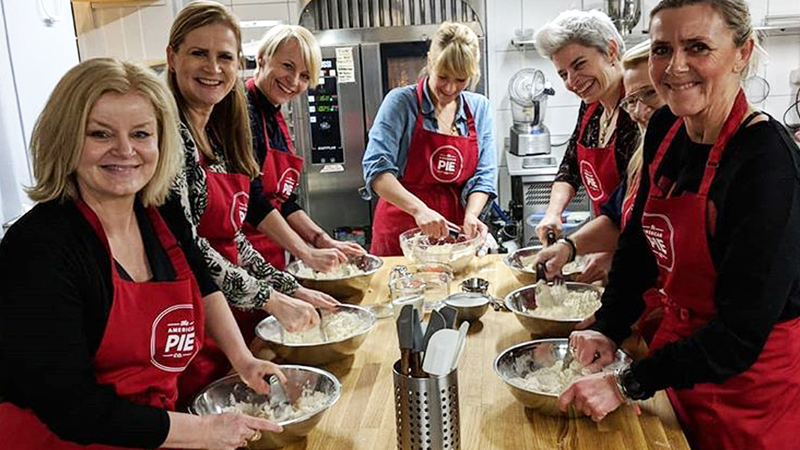 The women came together to create exactly what they had been missing in Denmark – a home away from home – making The American Pie Company nothing short of an experience. Set in a 300-year-old building just around the corner from Gråbrødre Torv in the heart of Copenhagen’s city center, the pie shop is designed in a 1920s-30s diner-meets-apothecary style, with hand-laid tile floors, original American antique lamps, vintage pie pans, and family kitchen knick-knacks hung on the walls. From the classic diner dishware, to the old-school blues and country classics pumping on the radio, no detail has been spared. 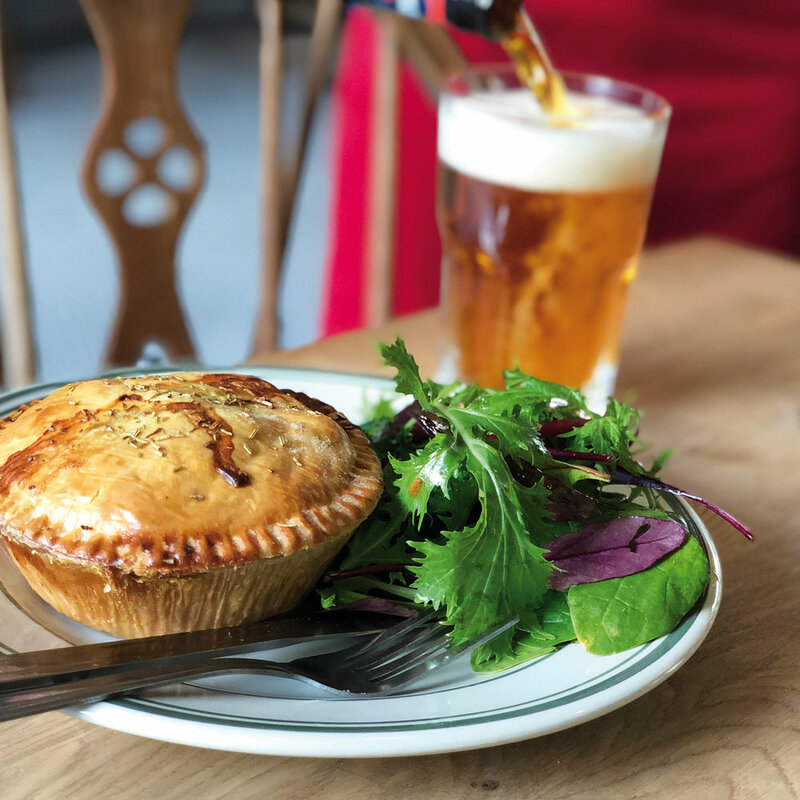 Specializing in both sweet pies by the slice and savory meat and veggie pies for a hearty meal, everything is handmade in The American Pie Company’s open kitchen with simple, quality ingredients. The menu changes every three months to reflect the season, and the pies have snappy names like “Yo’Mama’s Apple Cinnamon”, “The Muddy Nutty Chocolate Peanut Butter” or “I Got the Blues-Berry Ginger”, that keep the good vibes flowing. 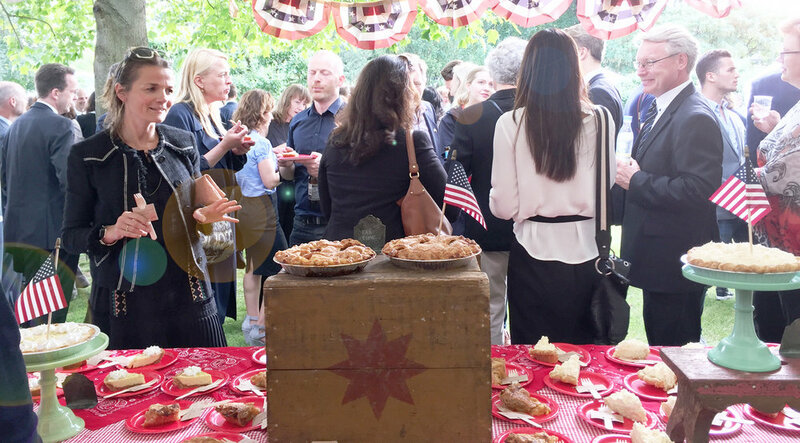 If you’re looking for an authentic American experience in Copenhagen, the American Pie Company has the right stuff. Whether it’s the cozy vibe or the delicious pie, it will surely win your heart.